my friend rachael over at imagine gnats happens to be coming up on her two year blog-iversary this april. (congrats!) and what's a blog-iversary without presents, right? so we thought... the more presents, the better. and let's throw in some prizes too!! here is where you come in: do you blog? do you appreciate handmade? do you like presents? do you have a new years resolution to join a swap this year? and what about those prizes? all right, then... let's talk details. what is the covert robin? a round-robin gift exchange of handmade presents. you get to make something special for another blogger, and you'll also receive your very own handmade present from a mystery blogger (your "covert robin"). first, you'll need to sign up (form below). then, my co-hosts and i will assign everyone a gift recipient. after receiving your recipient, you'll make your gift and send it off. and here's the extra fun part: when your gift is received, you'll be guest posting on your recipient's blog about your gift. 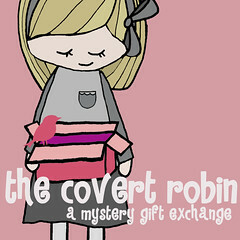 you'll receive a gift as well and share your covert robin's guest post on your blog. then we'll host a linky party to share your guest posts. finally, each of the co-hosts will be randomly awarding one participant a prize (that's eight chances to win!). Do you sing or play an instrument? Maybe you could record a song and send it along! Do you knit, sculpt, bead, paint, cook fabulous creations? Awesomesauce. Like to write short stories or poems? Do it! Maybe you don't 'think' you have any creative talents but you are a wiz at history or trivia or really really love to give affirmations to people to lift their spirits? I bet you could write some trivia or affirmations on playing cards and with the help of some paint or paper and create something someone would love. History and the sciences can be tricky..but they can also be the most awesome gifts ever if you think about it. Think Geek has cornered the market in science wonders..maybe you can come up with something funny to bundle up yourself and send along. Or hey, have you ever heard of Kate Beaton? She's my absolute favorite history comic artist. She knows how to make history hysterical. Maybe you can riff off her and draw a funny comic related to your history area of expertise? Still at a loss for what you can do? Have you ever heard of terrariums? Anyone can pot a plant prettily. See... so many possibilities. SO excited :) thanks for co-hosting, Courtney! I'm so excited! I can't wait to get my partner assignment! sounds too fun to pass up!